The Parvovirus is a viral sickness that can be easily acquired by dogs, especially in puppies. Once your dog has this virus, it can be hard to treat. Our product Bullyade can help aid your dog through the stages of parvo and possibly help them survive. Veterinarians identified the virus in the late 1970s where it killed thousands of infected dogs. This forced vet doctors to come together and quickly make a vaccine to counter the canine parvovirus infection. Before the vaccine for the virus, there was an increase in diseases, and the mortality statistics surpassed enormously. Although many dog owners are striving to protect their dogs from this infectious disease, there are still places where this infection undermines the lives of most; especially the unprotected ones. Parvo Treatment includes disinfecting you’re where you live. The disease is a lethal illness that is exceptionally transmittable. It can survive for quite a long time or even years, in objects such as toys, bowls, clothes and floors in your house. It is highly contagious to an unprotected K9, and it’s transmitted from one dog to another directly through their feces or exposure with an infected dog or anything that has been touched by one. The severity of the ailment depends mainly on their immune system. Bullyade has helped dogs surviving parvo. You can add it to their water or pour over their food. Note: Immunity happens on the level of antibodies (white blood cells) produced by their body and what came from their mother. So, it can depend on dog health. A mild infection will usually resolve in a few days, but when it becomes intense, the diagnosis may not be as hopeful as they can become extremely dehydrated and immediately pass way quickly (usually one or two days after not eating). The startling thing is the disease, takes a very long brooding period which makes it more dangerous since it’s highly contagious. Typically, it takes 5-12 days for symptoms to appear in your dog after exposure. Your canine dog could infect others without you even knowing. So, dog’s can contact this deadly virus by just sniffing a pile of feces from an infected dog. Sounds scary right? When you begin to observe a lack of hunger or appetite, high fever, and depression; stay vigilant as this is another manifestation of the virus. Try not to stress over it; this article will help you help them overcome these symptoms. When you observe fluid in their stool, contains bloody, noxious, and usually yellow. When the symptoms become more intense, secondary symptoms appear as extreme gastrointestinal distress, vomit, lethargy, and diarrhea. The virus is known to be a complicated viral disease that may be able to lead to their death. Therefore, it is your responsibility to act fast if this symptom shows. The later stages may result in shock, dehydration, and most times prove fatal. At times may even attack their heart thereby causing congestive heart failure and is possible after months or years of an apparent recuperation, from the intestinal form of the disease. The good news is there is a way to treat your dog, but you first need to identify these symptoms. It is crucial for you to seek the immediate attention of a vet if you observe these signs. Though an emergency visit may incur additional charges for proper medical care, if it eventually saves their life, isn’t it worth it? It’s why you have to act fast, because a young puppy may find it difficult to recover. The video below is an at home treatment plan, in the case you can not get to a vet due to location or circumstance. It is not a better alternative to visiting a Vet. The most important thing to Parvo Treatment is, to keep your dog hydrated. Sub Q fluids behind the neck are a must if you can’t administer an IV. 9 times out of 10 dehydration is the cause of death. If you can keep your puppy hydrated, there is a better chance they will make it. The ruff stages, usually last between 3-5 days. Keep them out of the heat. You must get your puppy some antibiotics. This is not an option at this point. Antibiotics are needed to fight off any secondary infections caused by the parvovirus. If you run into a situation that you just need a little more info or guidance call ManMade Kennels Edward Perez at 302-272-3625 he will help you. Keep your puppy in a quiet area to rest. Your puppy is sick, and they need to conserve as much energy as possible. Introduce all natural dog food to your dog slowly for nutrition. Give them some white rice and chicken broth to start out. Diet is necessary and, once they start drinking on their own, get them some Bullyade. Remember your pet has not eaten in a few days and has lost a lot of nutrients. Bullyade has many vitamins and is, perfect for supporting a full recovery as it has 18 Water-soluble Vitamins and Minerals. To kill the disease you must bleach everything (DC&R is the better option and you can purchase it at Tractor Supply). For the Bleach Treatment use, 5% Bleach to water. The Bleach will not ruin your grass, but can effectively kill the virus (Again DC&R is more effective at killing the parvo virus). Bleach everything your puppy may have come in contact with, clothes, toys, etc. Lastly, contact Eddie if you have any questions. He has helped hundreds of families save their furry friends also. His phone is 302-272-3625. Also, you can see some of his videos here. Dog breeds such as the Doberman Pinschers, Pit Bulls, German Shepherds, Labrador retriever, and Rottweilers have all the earmarks of being more prone to getting tainted. The most common form of transmission is from one dog to another is through their feces. Given the right conditions, the virus can survive for up to 9 months. The virus that causes this is released (in large capacity) in the infected puppy’s stool for almost a month after the infection. This infection can pass through ingestion or direct contact with the infected. Parvo can be conveyed in an adult dog, that reflects no external symptoms, yet the disease can show in their stool. The virus disease is not an airborne virus, but transmissions happen through birds and the sole of your shoes. 85% of dogs with this infection will die. However, after reading this, you should be in the 50% group that survives if treated. First off, Vaccination is the best way to protect them. It’s best to start the prevention procedure when your puppy is 6 – 8 weeks old. During the period of treatment, you should keep them separated from others until he receives his last shot for the virus. Vaccination commands a little amount of technicality because puppies need an injection on a precise schedule over a specified timeframe. This shot will help develop what they need to fight off this disease. For adult dogs, shots are an annual vaccination, though some vets extend theirs to two years. But if you think yours has infection signs, it is best for you to seek a veterinarian as soon as possible. If you fail to treat them, there’s only a 15% survival rate for him, even with the right treatment, they still have a 50% chance to live. Now, the best prescription is to prevent this disease entirely and also vaccinate your puppy against this lethal disease. In 1970, the virus was first discovered when it caused death in large part of the dog population. It forced vets to rub minds together and create a vaccine that will counter the virus. Their immunity will determine how severe the infection will be. Being partly genetic (passed on from the dog’s mother) but their body also needs to make what is required to battle the epidemic. This explains why they get three sets of vaccinations. Puppies under 24 weeks are most susceptible to the virus. During this time, they need at least three vaccinations to help resist the infection. It is one of the most important things required of you to do when you first own them. Your vet is in the best position to make you aware of it. The parvovirus attacks their body and restrains their ability to absorb fluid. When infection is mild, it can pass within a few days without any chaos. But a severe infection can result in death. The most critical thing is when you fail to notice any symptom until it’s already too late. Symptoms such as this, depression, and fever show up when the virus has infected all their major organs. There is an 80% rate, your pet will make it if owners act fast and they are treated with antibiotics and IV fluids to help boost recovery using Bullyade supplements. 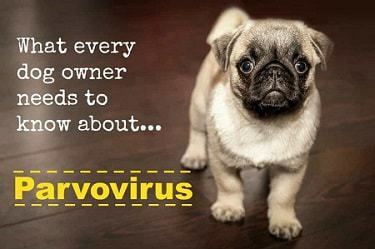 The parvovirus is very infectious and deadly. The virus can last for almost a year externally on daily household items. These can include toys, bowls, clothing or just the floor. High temperatures and disinfectants can’t remove or stop it from spreading. Vaccinating your puppy in three sets, plus the additional yearly shots will help their resilient to the virus. Recommendations are you don’t expose your puppy during their first six months, as this will ensure they don’t sniff feces of infected dogs, making them more vulnerable to catch the disease. Most vets recognize the signs, by foul-smelling feces. If you do this and observe any sign or symptom, make sure to see a vet as quickly as you can. They are in the best position to confirm how accurate it is or not. It’s imperative to act very fast, for your dog to make it. Have Bullyade available at all times. His poo is starting to get a hectic smell.. This can definitely be the parvo virus. May also be coccidia. We recommend you bring your pet to the nearest vet care office asap for diagnosis. Please remember, bullyade is designed to help pets recover from both of these illnesses. Coccidia will require albon to rid your pet of the parasite. Pingback: Giardia in Dogs, What are the Symptoms and Treatment?